Keeps track of items and where they are using Google Home. As a team who met and came together through UofT Hacks ’18, we shared a common passion to develop a useful tool for individuals, in which Google Home seamlessly integrates within a home environment. 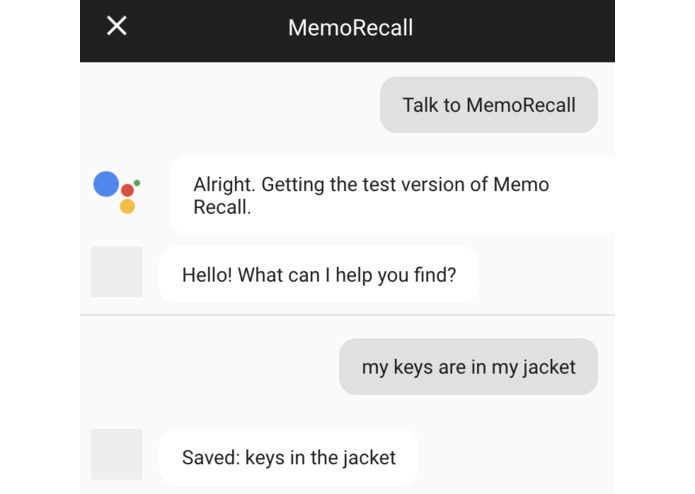 We wanted to give Google Home the ability to see, and understand the happenings of an actual home, which we were able to stimulate through the simple, yet powerful idea of MemoRecall. MemoRecall keeps track of items, and their associated locations through user input to the application. If the item is misplaced by the user, the program suggests the last place where this item was found. If the user checks and the item is not in this place, the program further suggests the most recent places where the item was located. This could be very beneficial for people who are affected by dementia. This was a learning experience for the entire team. At the beginning, we were unfamiliar with the tools needed to make a Google Action. However, this hackathon offered many resources and workshops to enable us to learn; through this and perseverance, we were able to overcome the challenges that came our way! There was a steep learning curve involved in this project, with no one in the group having any experience with the technologies used for the Google Home. That said, we are proud of taking the opportunity this weekend to work on a project out of the scope of our knowledge and to advance from not knowing anything about virtual assistants on Friday to being able to submit a an application pertaining to virtual assistants on Sunday. MemoRecall currently has a static functionality, with simple user inputs and program responses. However, we hope to create a more dynamic conversation flow. For the implementation, we hope to improve the efficiency of the way in which we store data, by using further abilities of Firebase. For the user experience, we hope to gamify this concept as well and improve the memory of individuals by encouraging them to remember misplaced items on their own.